Painted with Humbrol enamels for many years. 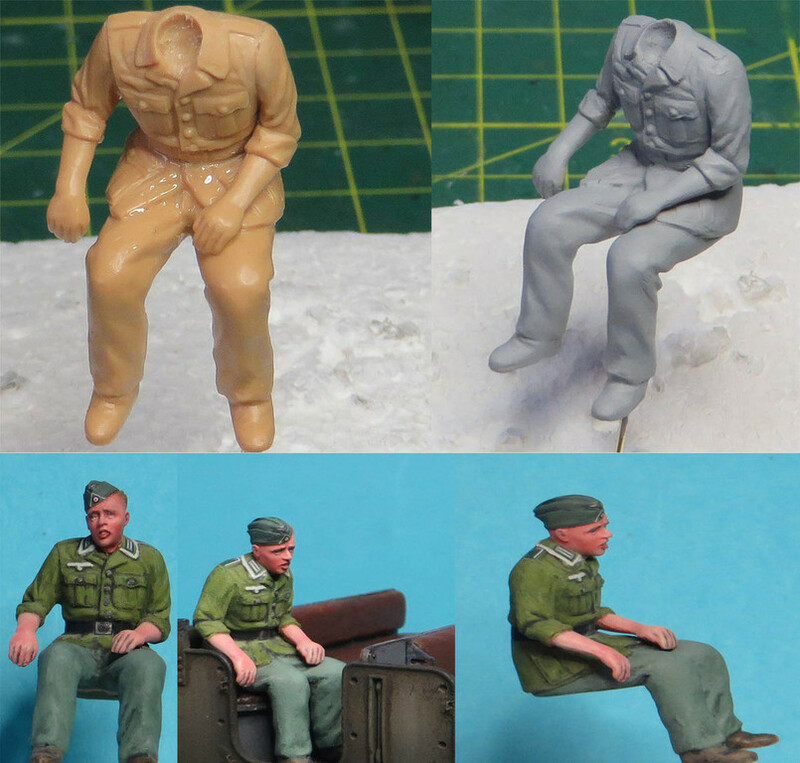 With very small amounts of oil paint mixed with enamel paint highlighted on figures has always been the general method . Painting figures in acrylics is a whole new unexplored level of painting . You could call it challenging, when the paint is brushed on the figure it is a lighter shade but when it drys, it drys to a slightly darker shade. next guy to be painted . Last edited by mike walsh; 07-09-2017 at 07:20 AM. Hey Thanks Tony , mate sorry for the late reply . I have been enjoying what you have been posting and all the vehicles look fantastic good one . Ok , here I am with the slow progress on this beast of a Famo and crew . The standard kit figure has the upper torso dremmelled out and glued together with Tamiya thin and thick glues .Was a Revell man for many years and then got talked in to using the Tamiya glue in the last few years and never looked back .The glue welds the plastic together well and there is very little filler required when using these glues . 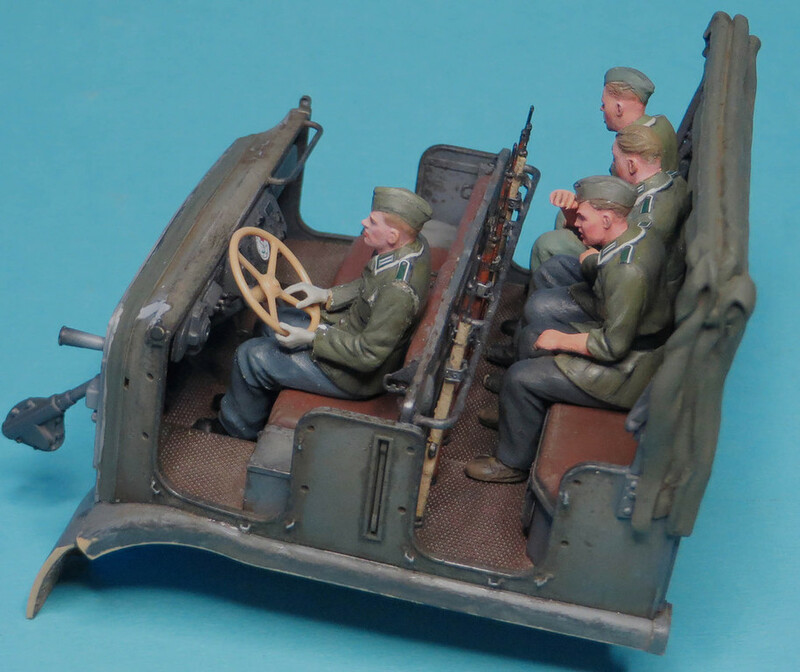 The figure was then painted in Mig's ammo primer ready for the enamels. Once again was a big fan of Humbrol primer but found Mig's Ammo primer is way better , quicker and easier to use. A couple of drops of primer and thinner and bang away you go . Cleanup is ever quicker with his cleaner . The figures are then given some time to let the primer dry and then painted in Humbrol enamels. Oil paints used for the face and arms with a black pin wash for the fingers , ears, eyes and mouth. 4 colours used for oils . red,white yellow and pink , applied a pastel beard with 2 colours,black and grey mixed and applied with a thin paint brush .Very sparse on the application but it is there is you look close . Tamiya decals used for the belt buckle collar tabs and cap and epaulettes. Gloss coated initially with testers Glosscote .Used Mr Gunze Mark Softener to apply the decals with warm water and finally Flat cleared with Testers dullcote. Last edited by mike walsh; 07-09-2017 at 07:16 AM. He's ready to ride,are we there yet? Yes the figures are slow and methodical.Trying to ensure they appear right. I know what you mean but I just have better luck with blending oils. They take longer to dry but we've got a food dehydrator and that speeds up the drying. Although the fabric of the last guy's uniform looks a little too greenish to me, I have to say I'm deeply impressed by your figure painting skills. His facial expression came out very well. In one of the updates a page before, the guy holding on to the tarpulin beam, standing on the platform - which manufacturer made this figure? He looks very realistically. Maybe I've over read it somewhere, but would you be so kind to tell me (again)? The figures standing in the back both come in the Famo kit. I changed the position of the arm and cut it at the sleeve,slightly turning the arm to be holding the tarp bow. The only change is with the hornet heads . Yes the uniform colour did come out a little bright under the flouro light .